Concrete pavers are not only popular for their durability but also for their aesthetic appeal. They can easily make a property stand out because of the wide range of available designs, textures, patterns, and colors. This paver type can also make properties more functional when installed by professional paver installers. That's why most property owners in Queens and other New York cities choose this paving material for their home improvement or commercial construction projects. Pavers are inherently beautiful and sturdy. However, you have to make sure that they are handled by an experienced contractor like us at Vinny & Son Contracting. With us, you are assured of exquisitely designed paver features that are built to last a lifetime. Our certified paver installers will ensure that your concrete pavers are installed using proven methods and techniques. We also follow systematic procedures to guarantee fast and quality installation. Our company has more than 15 years of experience in designing and installing concrete pavers for residential and commercial clients in Queens, NY and surrounding areas. Moreover, our owner has more than three decades of experience in European craftsmanship, so it is easy for us to create elegant paver amenities that make properties stand out effortlessly. Most homeowners, home improvement specialists, property designers, and contractors like us prefer concrete pavers over other paving materials because of their versatility. This paver type can be used for almost all types of paving projects, whether in commercial or residential properties. They can make landscapes more appealing and outdoor spaces more functional. At Vinny & Son Contracting, clients are assured of top-of-the-line paving materials. 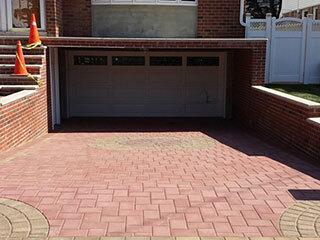 We make sure that we have ready access to the finest concrete pavers available in the market today. Some of the most sought-after paver suppliers that we have include Nicolock, CST Pavers, and Cambridge Pavers. These companies offer first-class pavers that are made from the finest raw materials and manufactured in state-of-art facilities. Cambridge Pavers, for example, have features that enhance the quality of pavers. They use Armortec technology that makes pavers more durable and virtually maintenance-free. Cambridge Pavers are also fade resistant, made for harsh weather conditions, and skid resistant. We are also certified by these companies to install their products. This means that we can expertly handle the installation process and guarantee the quality and workmanship of all the paving projects that we work on. 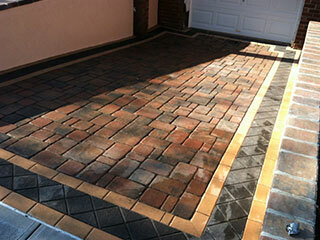 Whether you hire us to work on a paver driveway or install a small patio, you can always expect commendable results. If you want outstanding paver features and amenities, choose a professional and experienced contractor like us at Vinny & Son Contracting. Rest assured that the concrete pavers we will use are top-notch and will be installed by certified paver installers. Call our hotline at 718-539-0524.